Booking your rental car just got easier and more flexible. 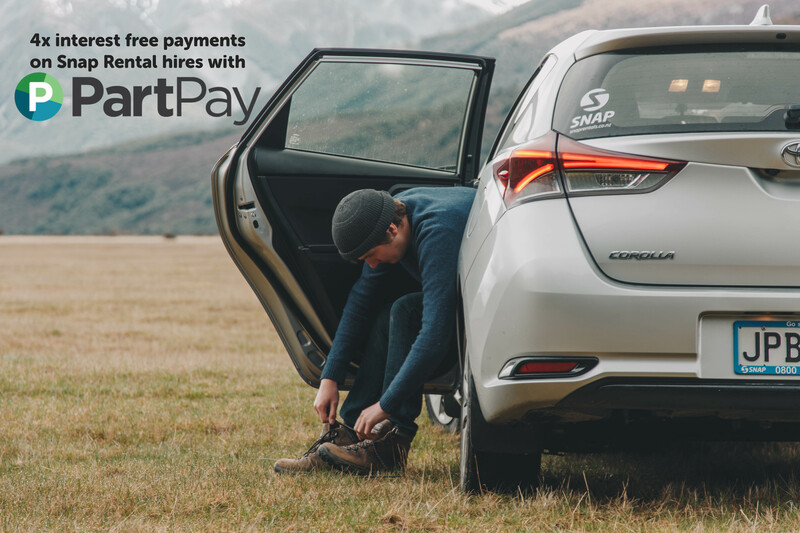 Snap Rentals is excited to announce a collaboration with PartPay, a leading New Zealand provider of the “Buy Now – Pay Later” movement. You might have seen or even used PartPay, or similar services, during an online shopping haul. The flexible payment plan allows you the option to plan around important calendar dates, like holidays, and manage your money. You still get your goods, or in this case your rental car, immediately – but without having to fork out the total cash amount. This leaves you with cash in your pocket and the freedom to spend your money how you like, especially important if you are travelling. Imagine having that extra dosh around, to stock up on all of the touristy trinkets you could desire, or upgrading to the suite room instead of head to tailing in a single bed. Using PartPay is simple and easy. Your booking total is spread over 4 interest free payments. There are no establishment fees, monthly fees or any interest – all you need to do is to pay the instalments on time. To start with you need to live in New Zealand, have a drivers licence, a valid debit or credit card and be over 18 years of age. When you get to the payment page of your booking, just select PartPay as your preferred method of payment. If you haven’t used PartPay before for other online shopping, we will need to grab some details so PartPay can run a quick credit check. The information needed is just simple things like address and date of birth and the credit check is run in real time – so you will know quickly if you can grab a car without any payment fuss. Once your credit check is complete you need to have a look over the payment schedule and agree. To lock things in, you pay the first 25% upfront – easy, the car is yours. Then you pay 25% over the next 3 fortnights via an automated charge on your credit or debit card. Remember there is no interest or charges ever, unless you miss a payment. Using PartPay, keeps all the fun in travel. You have the control to spend your money how you want, when you want. Get behind the wheel of your Snap Rentals’ car and enjoy your trip, without the worry of maxing out the budget. Simple.